Before Fannie Merritt Farmer there was Mrs. D.A. (Mary) Lincoln. Mrs. Lincoln was co-founder with Maria Parloa of The Boston Cooking School, and was Miss Farmer’s teacher. After graduating, Miss Farmer taught at the school and later took over the running of it. Mrs. Lincoln’s book (expressively titled: Mrs. Lincoln’s Boston Cook Book. What To Do And What Not To Do In Cooking) was published in 1883 and Miss Farmer’s best-seller The Boston Cooking-School Cook Book (1896, first edition) bears a strong similarity to it without giving credit where it was due. But while Miss Farmer freely used Mrs. Lincoln’s book as a template for her own, her cook book (for all that it is the more well known of the two) lacks the sparkle of her mentor’s. 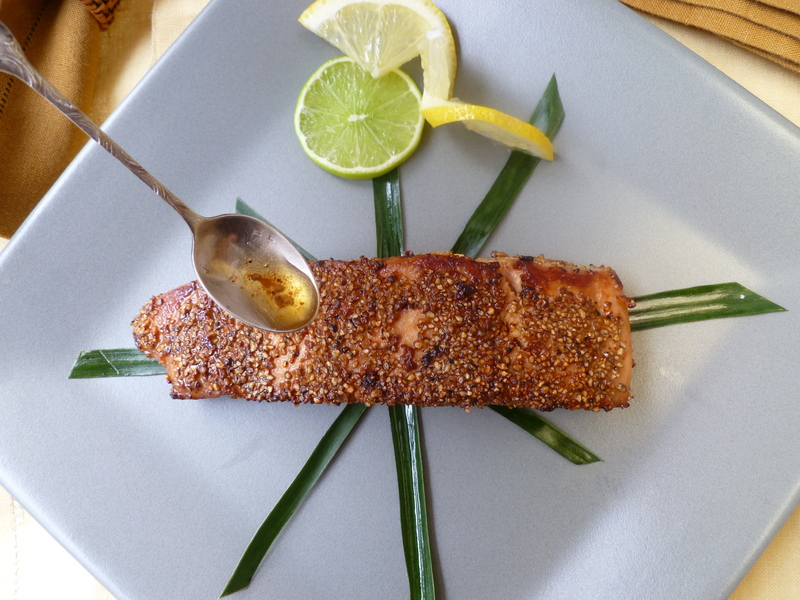 Applying the sage’s advice to this recipe for Salmon ‘au poivre’…the diplomatickitchen ‘knows’ from experience that many people enjoy salmon fillets marinated, lightly coated in peppercorns and quickly cooked in olive oil and butter. 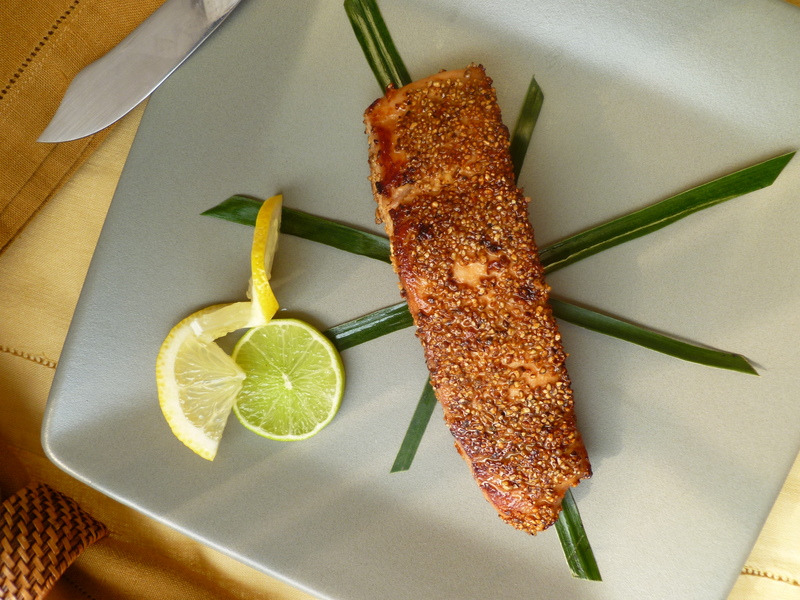 8 pieces of Salmon Fillet: The photographed fillets weigh about 200g or 7 ounces each. 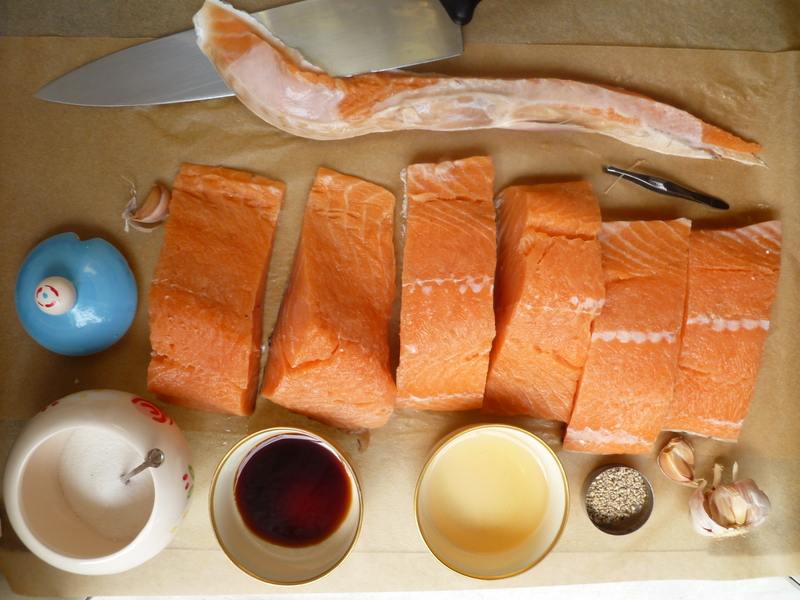 A whole Salmon Fillet, cut into 2-inch slices will make 6 pieces of this size (not including the flat tail piece). Two additional pieces cut from a second fillet would be needed for 8 people. 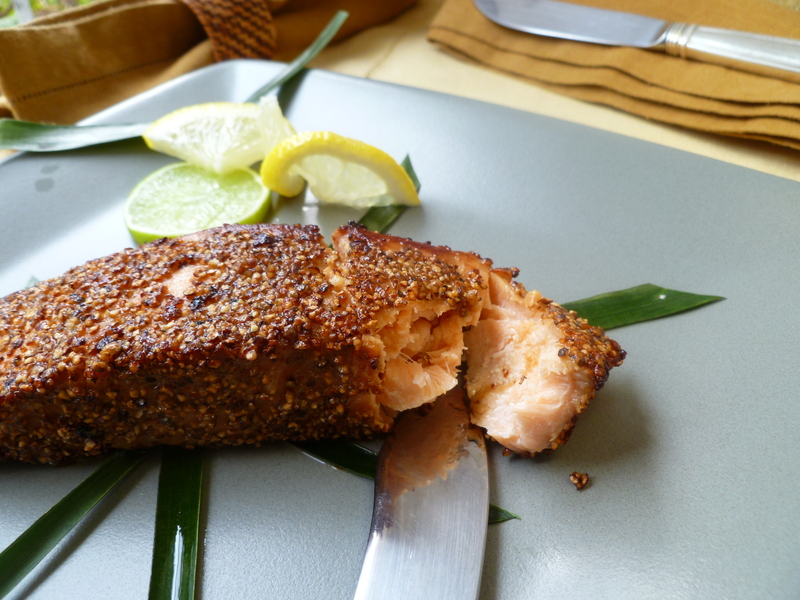 But, in a dinner of several courses, smaller pieces would be fine and a whole fillet could be cut into 8 slices. 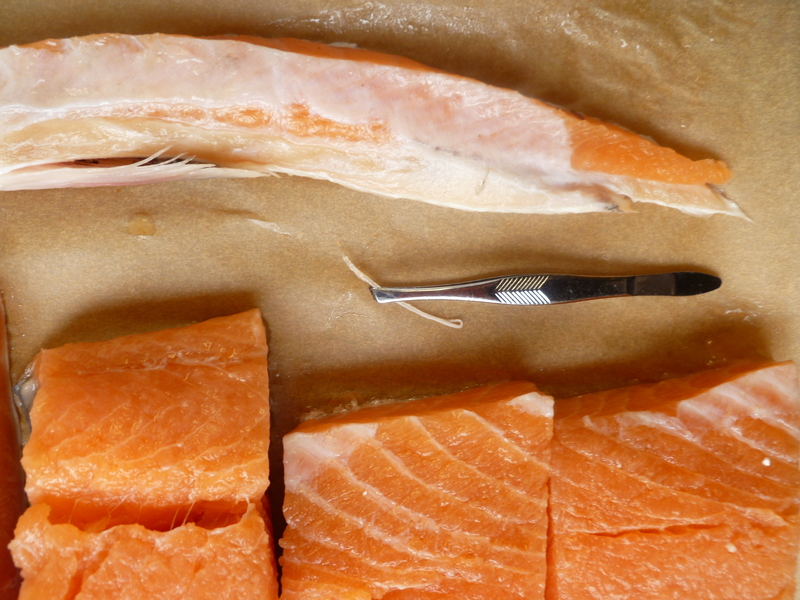 The pieces used for this recipe measure about 1 and 1/4-inches at their thickest point–which may be helpful in estimating the cooking time for the fillets you use. 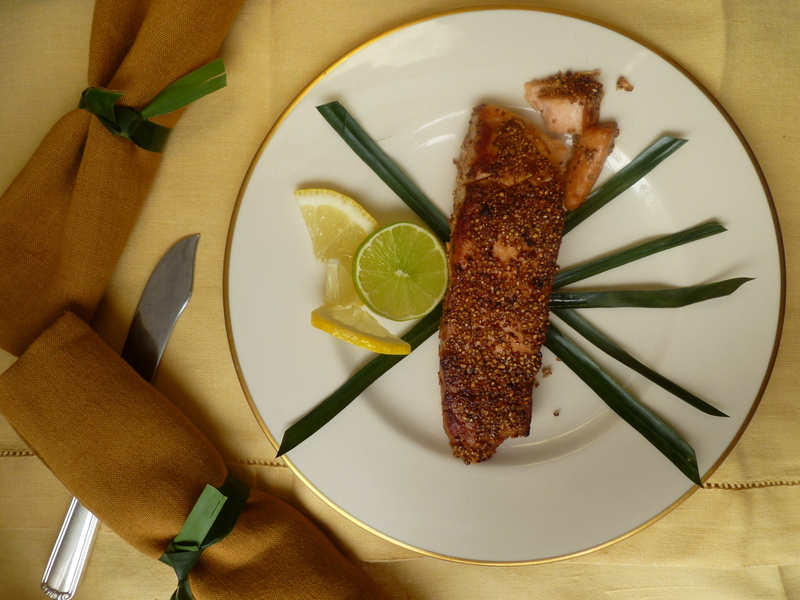 Optional Last Touch: Strips of Oiled Banana Leaf and/or Twists of Lemon and Slices of Lime: Ingredients and instructions are given below, after the recipe for the salmon. 1 or 2 wide, heavy-bottomed Frying Pans: For two pans divide the oil and butter and place 1 Tablespoon of each in each pan. If using one pan, sauté half of the fillets, pour the butter and oil in which the fish cooked into a small heatproof cup (for dribbling a little over fillets right before serving), wipe out the pan, add another Tablespoon each of oil and butter and sauté the rest of the fillets. 1. In each of 2 plastic bags, mix 4 Tablespoons of soy sauce, 4 minced garlic cloves, 2 Tablespoons of Sherry and 2 teaspoons of sugar. Alternatively, the entire amount of marinade may be mixed in one container: 8 Tablespoons of soy sauce, 8 minced garlic cloves, 4 Tablespoons of Sherry, and 4 teaspoons of sugar. 1. 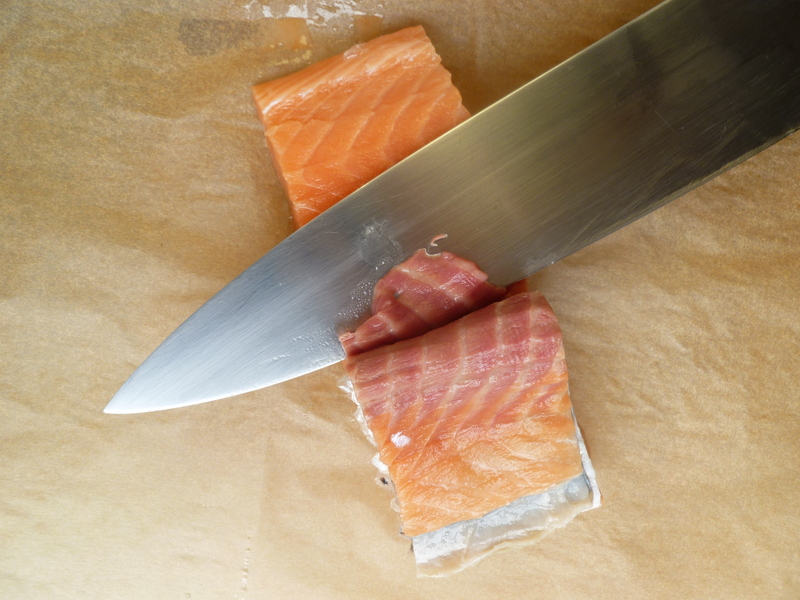 To cut pieces of fillet from a whole half fillet: trim off the long piece of belly fat. 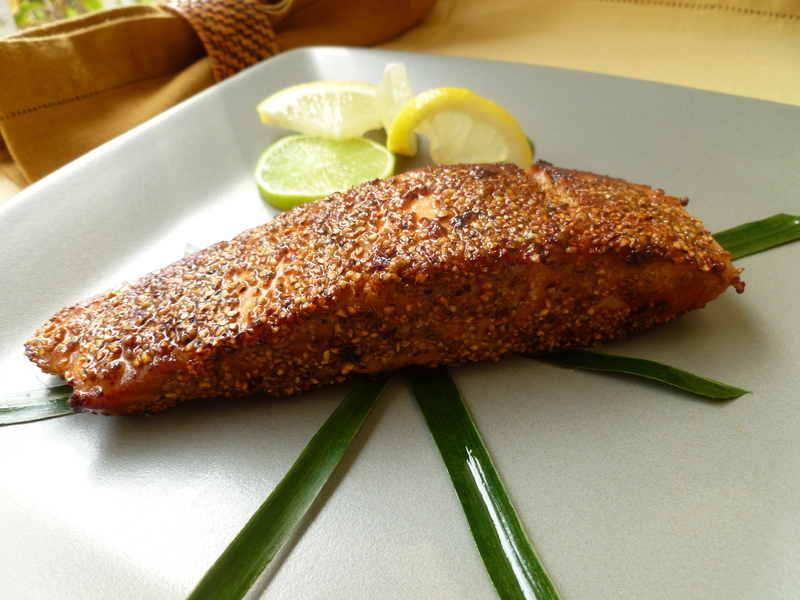 The whole fillet half in the photos is cut into 2-inch slices, each weighing about 200 grams of about 7 ounces. 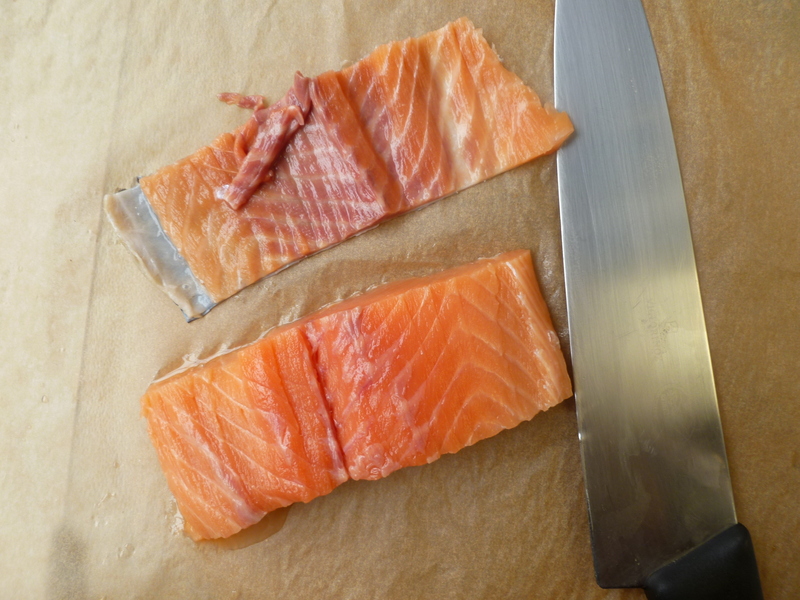 (The flat tail piece is not used for this recipe; it may be wrapped and frozen to use later in some other way…grilled, for example, or made into a chowder.) For 8 people, 2 more fillet pieces from a second fillet are added. 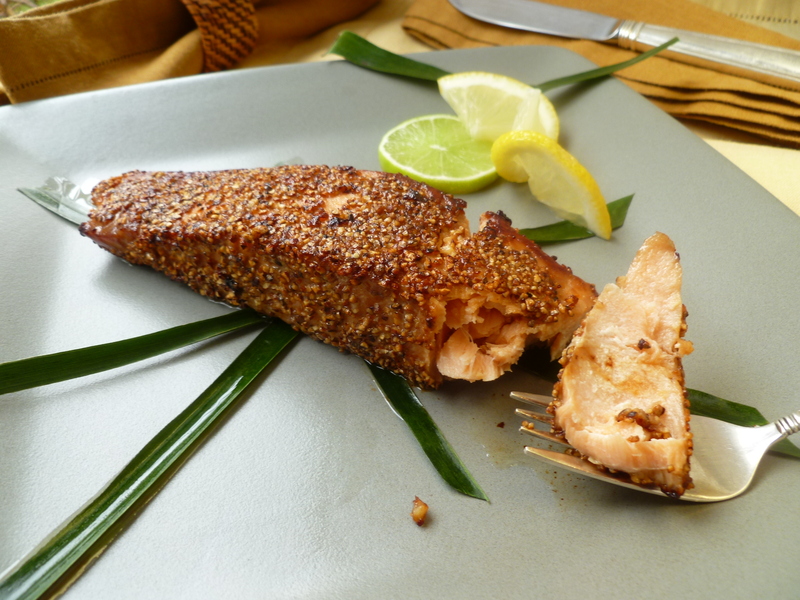 However, for a dinner of several courses, a whole half fillet could be cut into 8 smaller pieces. 2. 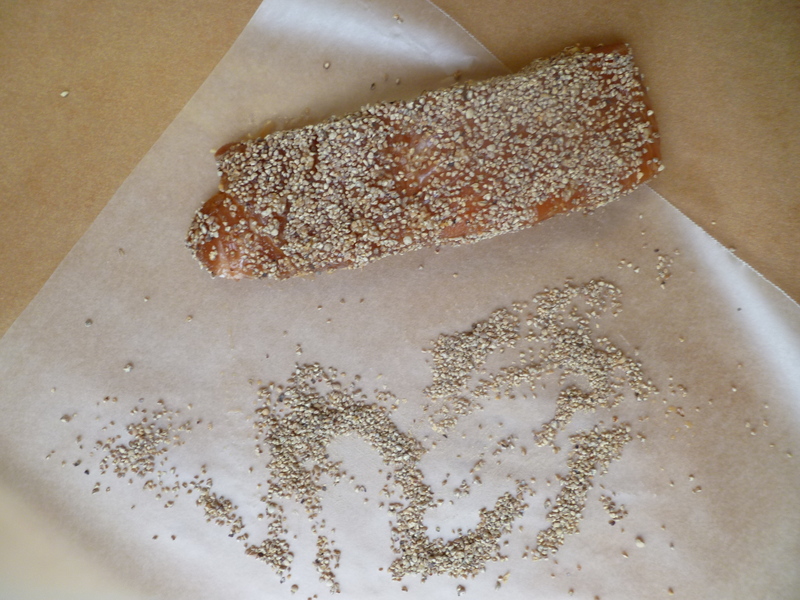 Run your fingers over the slices to check for stray bones and remove them with a pair of tweezers. 4. Put 4 fillets in each plastic bag of marinade–or place all 8 pieces together in one container of marinade. 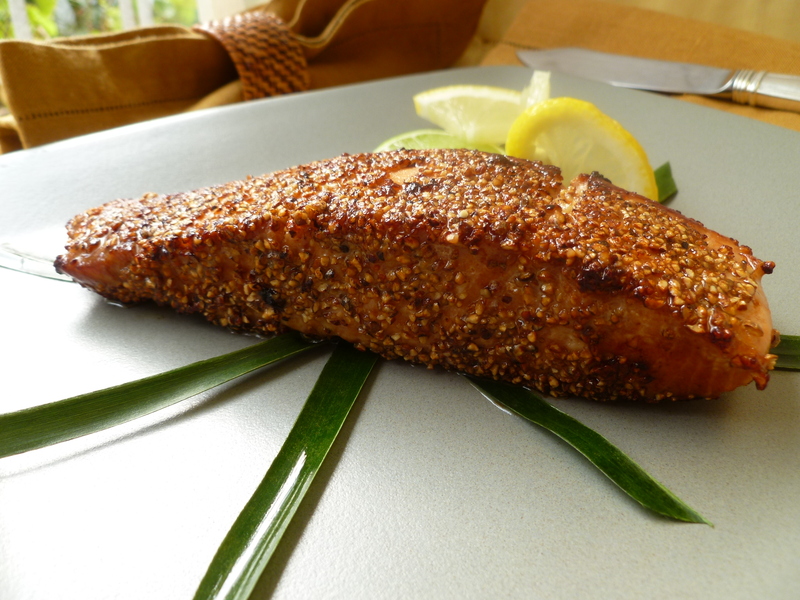 Marinate the fillets in the refrigerator for an hour or overnight. 3. 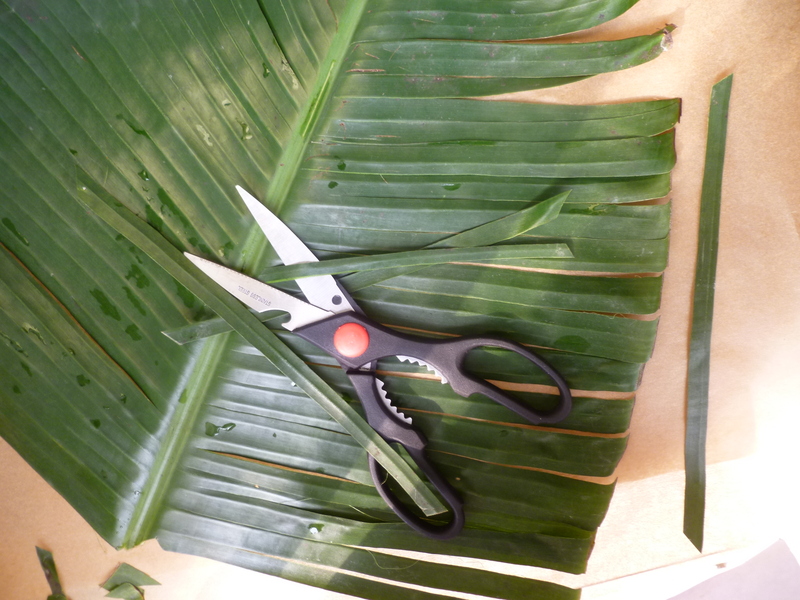 Transfer the fillets to plates (onto the strips of banana leaf if you are using them) and, also, if you like, decorate each plate, as well with a Lemon Twist and a slice of lime. 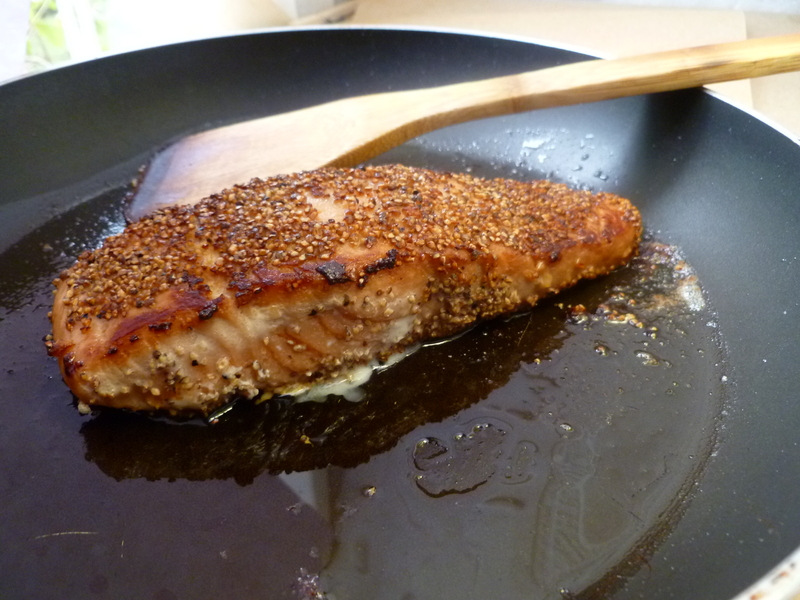 Finally, spoon a tiny bit of the oil and butter in which the fish cooked over each piece…. 1. 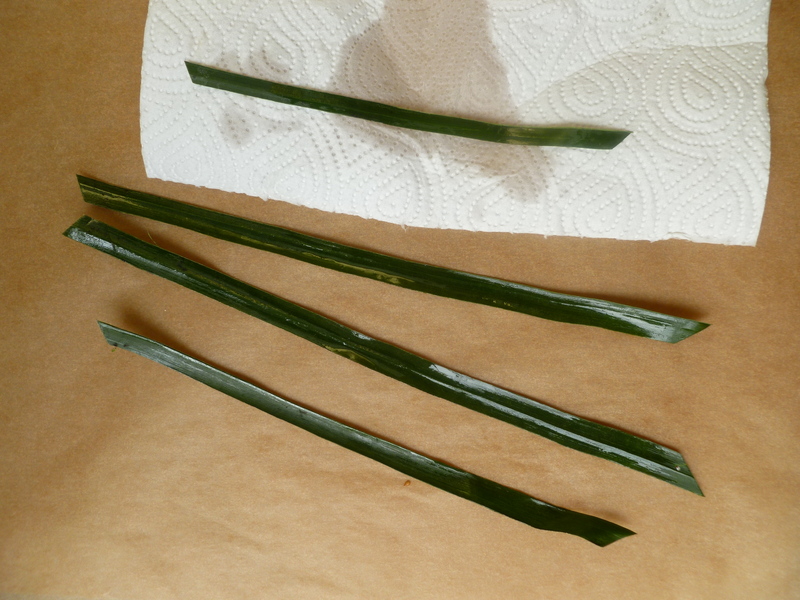 With your fingers, rip the leaf into strips along its ridges up to the spine, so that it resembles a palm frond. Clip off as many strips as you want to decorate each plate. 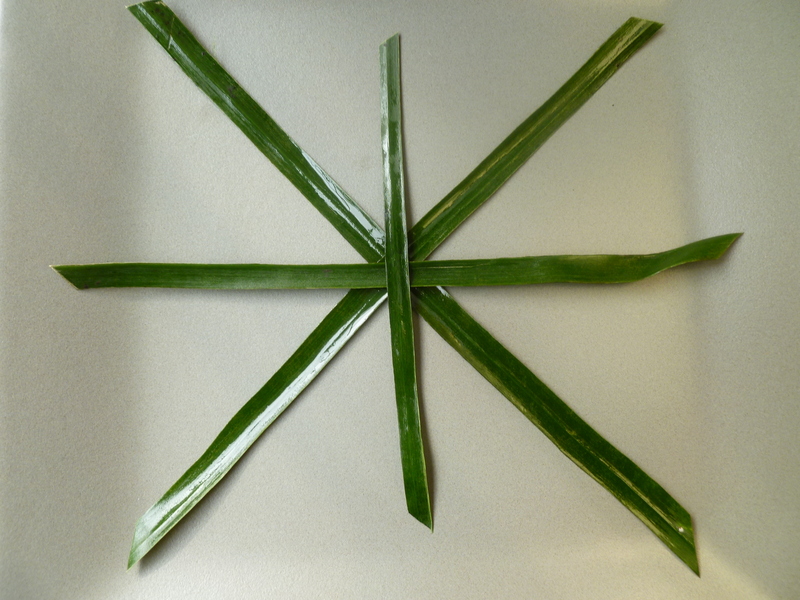 (The photographed design is a simple one using 4 strips for each plate.) Trim the ends of each strip on the diagonal. Note: See illustrations here in the previous diplomatickitchen post describing a Twisted Orange Slice garnish. The method is the same one used for making Lemon Twists. 1. Cut 8 rounds of lime and set them aside. Also slice 8 rounds of lemon. Cut straight through the middle of each lemon round from one side just to the inner rim of the other side. 2. Twist the two attached halves in opposite directions. 3. 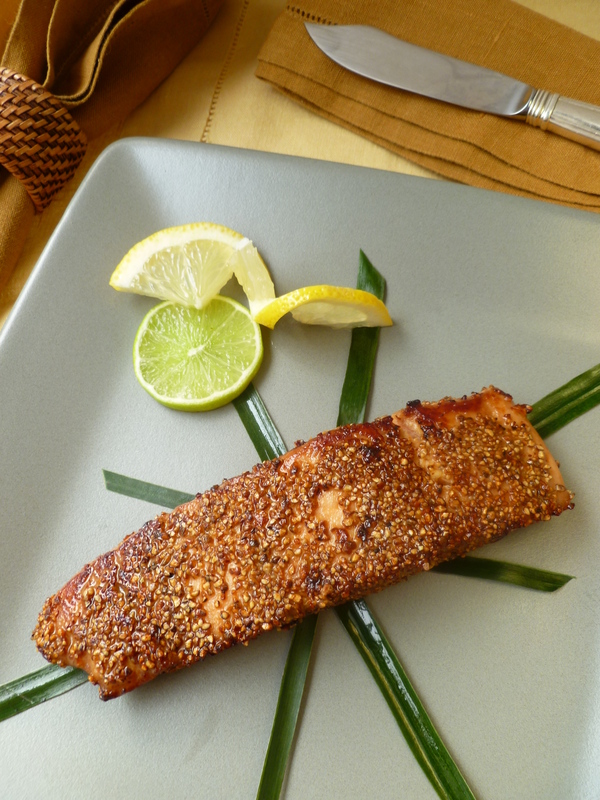 Place a Lemon Twist and a slice of lime on each plate. 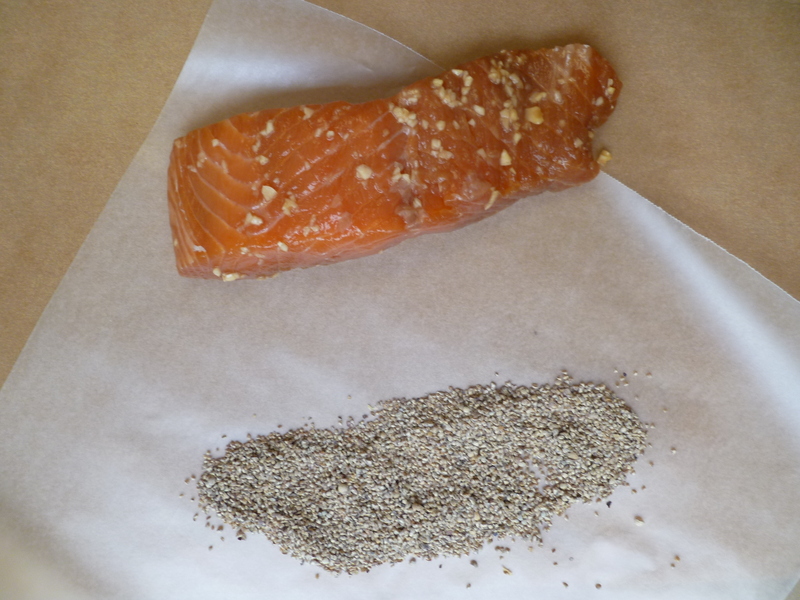 A Note: Salmon ‘au poivre’ is the Main Course in the Dinner Menu: Mixing Dinner and Business. It is adapted from a recipe that appeared in the June 1992 issue of Gourmet Magazine and is available here on the Epicurious website. A Second Note: For anyone who would like to compare the similarities in content between Mrs. Lincoln’s and Miss Farmer’s books, both cookbooks are available to read free online–Mrs. Lincoln’s here in the California Digital Library, and Miss Farmer’s here at bartleby.com. While Miss Farmer’s book closely follows Mrs. Lincoln’s, the two ladies’ writing and teaching styles make an interesting contrast. What a fantastic idea! My husband absolutely adores steak au poivre, he would love this. I’m definitely making it soon! Meant to post my comment on this post, not the potato and ham croquettes (though those look delicious too!) Man, the computer does not like me tonight! Anyway, this looks awesome, I’m definitely making it soon.